TIME-LIMITED SPECIAL OFFER (original price : 3500 €). 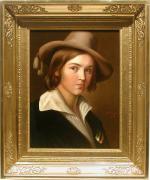 Our perfect portrait of an Italian youth was created by famous Austrian painter Joseph Ernst Tunner (Tuner)(1792-1877). The artist studied in Vienna Academy, later in Prague under Josef von Fuerich and in Rome, where he was close to art school of Nazarener. 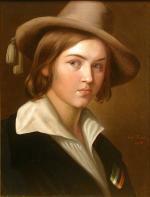 In 1840 Tunner became a director of Ladscape Draftschool in Graz. Inscription: signed Jos.Tuner, dated 1848 to the right. Technique: oil on canvas. Empire style massive gold-plated frame. Condition: in good condition, unlined, some tiny touch up inpaintings on the clothes.